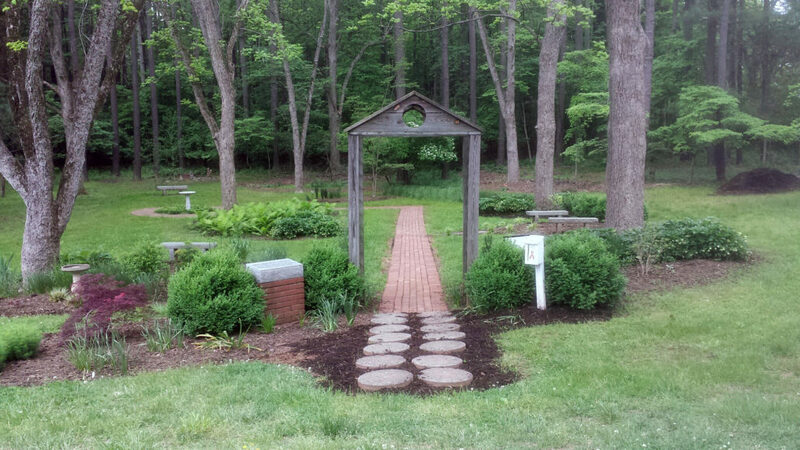 The AIDS Memorial Garden is located at Tanglewood Park in Clemmons, NC. It was developed in 1997 by two Senior Girl Scouts, Erica Brady and Carrie Watson, as their Girl Scout Gold Award Project, and realized through donations by local agencies and individuals and with many hours of hard work by volunteers. The Garden serves as a memorial to those lost to AIDS, a place of solace for those living with or affected by the disease, and an inspiration for those continuing to work for progress against HIV/AIDS. It is located in a grassy area shaded by pecan trees and is adorned with irises, ferns, benches, and bird baths. A brick path winds through the Garden. 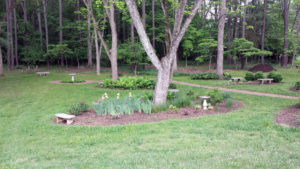 In subsequent years, improvements and maintenance to the garden were provided by members of HOPE (HIV Outreach Programs and Education), students at The Summit School, and members of the Unitarian Universalist Fellowship of Winston Salem. Currently, the garden is maintained by the Wells Fargo NC Triad Pride Team Member Network. The Garden Cleanup team typically meets the second Saturday of each month; please consult our calendar for updated dates and times, and join us! On June 9th, 2018, join us for a Out At the Park potluck picnic at the Garden, co-sponsored by the Wells Fargo NC Triad Pride Team Member Network and North Star! Engraved bricks may be ordered for placement in the path (in honor of, in memory of, given by, or simply the name of an organization). Contact PRIDETriad@wellsfargo.com for details. Joe’s Landscaping & Nursery Co. 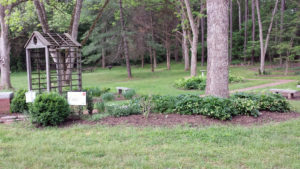 The Garden is located on Nature Trail Dr. in Tanglewood Park in Clemmons, NC. It’s a very short dead-end street, so it’s very hard to miss the Garden. From Winston-Salem, take I-40 W to Exit 182 (Harper Rd./ Tanglewood). Turn left onto Harper Rd. Proceed to the next stop light and go straight through it, then take the first left onto Nature Trail Dr. Parking is provided in front of a Tanglewood Administrative Building (looks like a ranch style house). The Garden is to the left of the house.